The successor to the most sold slackline in the worlk! 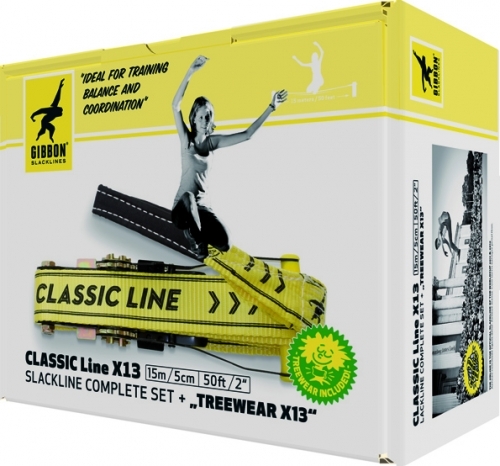 The CLASSIC LINE X13 is the ideal slackline for children and teenagers with advanced requierements. The ambition is enhanced with longer distances, as it becomes harder and harder to master this challenge. A slackline that offers fun to children and grownups alike! Tree Pro Sets:GIBBON compliments these sets with the newly developed TREE PRO tree protection. ALL TREE PRO SETS therefore not just fulfill the requirements of the German industry norms (TÜV/DIN), but also coincide with the high quality standards of GIBBON. They are probably the first sets on the market that offer everything needed for experiencing slacklining in a safe and easy way. Available in two different lengths.